American Express Gift Cards Promo Codes, No Fees, Free Shipping, and Coupons! Finding a Chase Bank $500 Coupon to fit all your banking needs can be quite a hassle. With endless options currently available, researching the right offer will often take a while. However, you can now be relief knowing Chase Bank is offering a $500 bonus to residents nationwide when you open a Chase Total Checking® account and a Chase SavingsSM account online or in-branch by June 14, 2018. For those who are interested, be sure to meet the account qualifications in order to receive the generous offer. Once you have done so, you will have full access to a host of account features to better your banking experience! However, I highly recommend you apply as soon as possible, as the offer tend to end earlier than the stated date! Early Termination Fee: If either the checking or savings account is closed by the customer or Chase within six months after opening, Chase will deduct the bonus amount for that account at closing. Apply online now to open your qualifying accounts or enter your email address to get your $500 Chase coupon, then visit any Chase branch with your coupon by June 14, 2018. Checking offer is not available to existing Chase checking customers. Savings offer is not available to existing Chase savings customers. Both offers are not available to those with fiduciary accounts, or those whose accounts have been closed within 90 days or closed with a negative balance. Bonuses are considered interest and will be reported on IRS Form 1099-INT. Bonuses will appear within 10 business days of meeting the requirements. Savings bonus needs $15,000 of new money. The new money cannot be funds held by Chase or its affiliates. 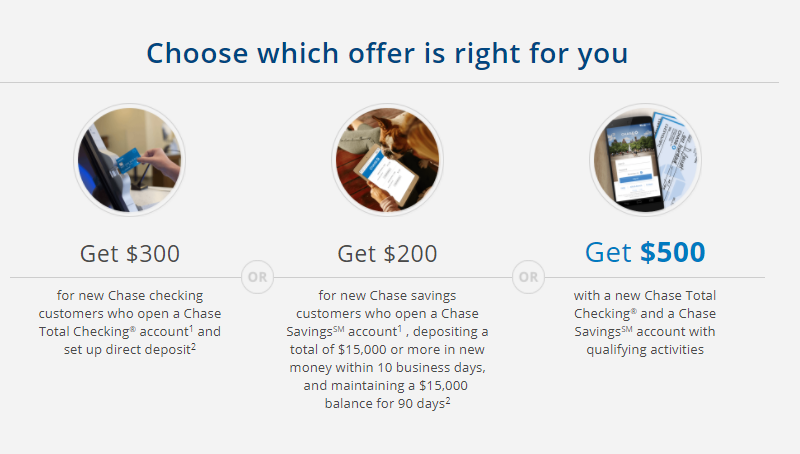 The $500 bonus from Chase Bank is one of those offers that appears every now and then. It is not typically publicly advertised, so finding this offer can prove to be quite difficult. However, we have already done the research for you! Obtaining the bonus does require quite a few steps. Qualifying customers can earn the bonus when you open both a checking and savings account, given you have provided the requirements. Personally, I would definitely apply as soon as you can, as mentioned, the offer tends to end sooner than expected. However, if you are not currently interested, then be sure to check out our complete list of Bank Deals for all your banking needs! Hi I have opened a Disney card checking with chase and did not receive any money. I have direct deposit I heard numerous times that chase gives gift cards out of $200 to even $500 so please contact me asap thank you ? Where To Buy or Sell Gift Cards? Disclaimer Gift Cards No Fee has financial relationships with some of the products and services found on this website, and we may be compensated if you choose to utilize any of these links when applying. We attempt to keep the information found on Gift Cards No Fee as accurate as possible. Please verify FDIC Insurance / NCUA Insurance status, credit card information, and interest rates during the application process. Copyright ©2014 giftcardsnofee.com. All rights reserved. Site Map.